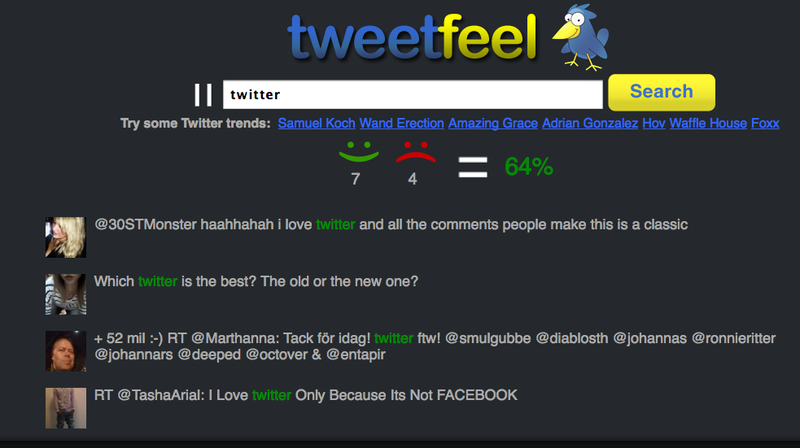 Well not exactly real time sentiment analysis, but Tweetfeel does quickly grab a batch of the most recent keyword specific Tweets and present them in a way that gives its users a general sense about what the prevailing sentiment is about a subject. Whether the Twitter data set is large enough to draw accurate conclusions remains questionable though. For instance, a search for Twitter in Tweetfeel produces a near equally divided set of responses both “for” and “against” Twitter. Curious results since all of the “sentiment” gathered about Twitter is from Twitter itself. This entry was posted on December 4, 2010 at 4:33 pm and is filed under Real Time Sentiment Analysis, Tweetfeel. You can follow any responses to this entry through the RSS 2.0 feed. You can leave a response, or trackback from your own site.